We all know that women with gestational diabetes need to vigilant about their diets during pregnancy—but recent research indicates that one surprising health risk could be reduced through eating healthier your whole life long. Here's the bad news: Pregnant women who contract gestational diabetes are at risk of several health issues—and not all of them end after their pregnancy. One such risk is for developing high blood pressure later in life. But there's some good news: there's one very simple way to bring this risk down, according to recent research—and it's all to do with what you eat. A study from the American Heart Association reached this conclusion after observing 3,818 women who had histories of pregnancy-related diabetes. The ongoing study went on for 22 years and found that 1,069 of the women developed high blood pressure, which increased their risk of having heart attacks or strokes later in life. 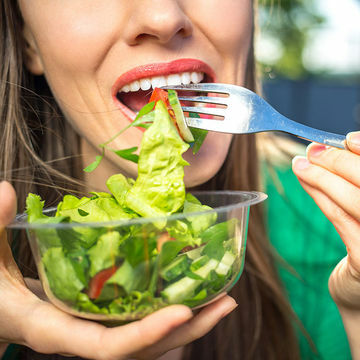 Here's where things get interesting: According to the researchers, women who maintained healthy diets were 20 percent less likely to develop high blood pressure than those who did not. Weight played an important role too: Increased body mass index explained 20 to 30 percent of the link between diet and high blood pressure risk. "Our earlier research showed that diabetes in pregnancy increased a woman's risk of developing hypertension, even 16 years after giving birth," Cuilin Zhang, M.D., Ph.D., senior study author, said. "Our current study shows that a healthy diet, which has been proven to reduce high blood pressure risk in the general population, appears to be equally effective in reducing the risk in this group of high risk women." Obviously, the idea of eating a healthy diet is nebulous. Will indulging in a burger every now and then up your odds of developing high blood pressure later in life? Probably not, but it's important to keep things healthy more often than not. Other factors should be considered, too—smoking, alcohol consumption and physical activity also come into play. According to the study's release, those who ate healthy diets (think fewer trans fats, more fiber) were less likely to smoke, drink to excess and live sedentary lifestyles. In order to reduce your risk, aim to eat a diet rich in fruit, vegetables, fish, legumes and whole grains and cut back on red meat, salt and processed meat, as the study found that those who stuck to similar eating plans had lower odds of growing into hypertension.